Guess what? 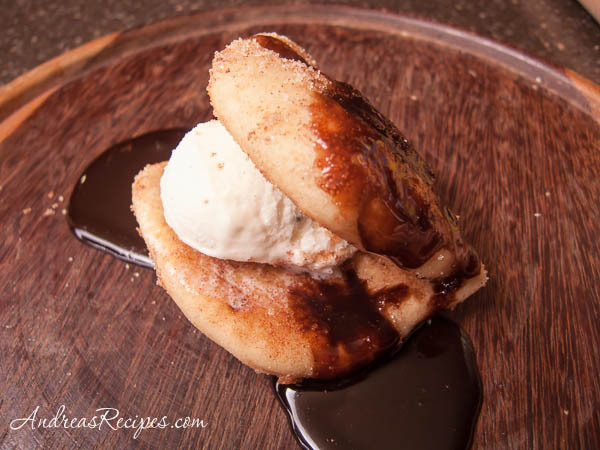 It is grilled pizza enrobed in cinnamon sugar with French vanilla ice cream in the middle and chocolate sauce on top. How’s that for an insanely good dessert pizza? Yes, my hand slipped and I went a little overboard with the chocolate sauce, but it still tasted delicious! This delicious creation comes from Chef Craig Priebe and his first cookbook, Grilled Pizzas & Piadinas, recently released by DK Publishing. I received an invitation to review the book and host a give away, and I only had to think about it for a nano second. Pizza is my favorite food and any chance to play around with my favorite food will make my day! As soon as I saw Priebe’s incredible dessert inspired by churros (photo above), I knew what we would have for our Cinco de Mayo celebration. Happy Cinco de Mayo! Priebe formerly owned C.K.’s Grilled Pizza in Atlanta, and his creative take on this great American favorite garnered acclaim and awards. As I read the book, I knew this was a man who loves to make pizza; it’s not just a job for him, it’s a passion, and the book shows that. He starts with the basics and introduces the required equipment. Do you have a grill? A pair of tongs? A cookie sheet? Then you can make grilled pizza. You can even make the pizza indoors on a grill pan or bake it in the oven if you prefer. After acquainting you with all the gear, he dives right into the basic dough recipe and his favorite sauces and toppings. Then he demonstrates proper grilling technique, after which he leads you on a feast for the senses with beautiful photos and recipes for great topping combinations. His basic pizza dough recipe is truly easy and will keep in the refrigerator for up to three days. I made the dough on Friday night and grilled on Sunday, and the dough had taken on a very nice yeasty flavor after sitting for two days. I fell hard for the grilled crust. I think it’s as close to a brick oven pizza as I can get at home, and the pizzas take on a lovely smokiness that plays well with the thin, crispy crust. We made two savory pizzas that I will show off later this week, and we used the basic pizza dough recipe for this dessert, which my boys couldn’t get enough of. Priebe also offers recipes for a dessert dough as well as piadina doughs, and even if you aren’t a scratch cook, Priebe says that Trader Joe’s fresh pizza dough works very well on the grill. He even tosses in his favorite salad recipes for accompanying pizza and provides helpful tips on party planning with grilled pizzas, including specific recommendations for which pizzas to make for the main course, the best salad, and the best dessert pizza. Now in Chicago (my old stomping ground), Priebe has put his talents to work as the chef for Henry Crown & Company, and yes, he’s even making pizzas for the people at the investment firm. If I can just convince him to come to DC sometime and teach a few pizza lessons, I would call us very lucky! That’s an open invitation, Chef Priebe! Of course I’m going to share his recipe for making those delicious churros, but first let’s talk about the give away! I have one copy of Priebe’s new book to give away to a lucky pizza grilling fanatic or wannabee. If you want to win your own copy of Grilled Pizzas & Piadinas, leave a comment below telling us your favorite pizza toppings. Please make sure your email address is correct so I can contact you if you are the lucky winner. Apologies to my international readers, but the book can only be shipped within the continental U.S. The contest closes at 6 P.M. EST on May 11, and I’ll have Random.org select the winner. Look for the announcement of the winner in this post soon after. UPDATE: Congratulations to our winner, Alejandra of Always Order Dessert! A copy of Grilled Pizzas & Piadinas is on it’s way to you! If you want to catch up with Chef Priebe at a book signing or other event, check out his schedule to find out when he will be in your area. 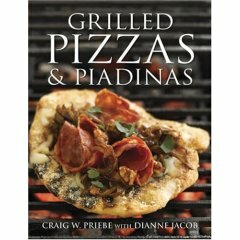 Adapted from Grilled Pizzas & Piadinas by Craig W. Priebe with Dianne Jacob. 1. Preheat the grill to about 400° F/204° C.
2. Combine the cinnamon and sugar in the medium bowl. Set aside. 3. Roll the pieces of dough into small crusts about 4 inches (10 cm ) wide. Grill for about 2 to 3 minutes one one side and one minute on the other. 4. Brush both sides of the crust with the melted butter. Place the crust into the cinnamon sugar mixture and coat well. 5. To serve, place a small scoop of ice cream in each crust. Fold the crust in half and press down to seal. Drizzle the chocolate syrup on and serve. Wow! These are gorgeous and I can only imagine how delicious they are! I’m actually a sucker for a margarita pizza–thin crispy oven baked crust with milky mozzarella di buffala, thin slivers of tomato, and a shower of fresh basil. Nothing beats it! I like the classics. Pepperoni and lots of melty cheese! I have actually eaten a few “chocolate” pizzas with all the toppings……caramel, toasted walnuts, coconut, toasted pecans, cranberries, chocolate chips and chocolate ganache (the decadent sauce……YUM) Of course if we are talking “traditional” pizza and the usual toppings, I love a thin crust and adore mozzarella, cheddar, bacon, mushrooms, onions and extra sauce with fresh basil. De-Lish. What a fun giveaway! I love pizza! I am a pretty old school pizza girl – cheese or sausage is yummy. I also love veggies (mushrooms, bell peppers, onions, etc etc). Wow… a whole book with pizza recipes… oh my, this is too good to be true!!! My favorite toppings are the classic ones… like sausage or pepperoni. Also I love sun-dried tomatoes and arugula. Sounds delicious, my family makes our own pizza once a week – grilled is our preference too – and it will be great to add a dessert version! My favorite pizza toppings are mushrooms with onions and a handful of fresh arugula tossed on the finished pizza for some zip. I like lots and lots of olives, but I’m thinking I may have to switch to chocolate after that picture. Yummy looking dessert pizza! Personally when I make my own pizza at home (alot) I tend to go vegetarian, so broccoli, red onions, mushrooms, lots of cheese (goat cheese is yum!) If I’m feeling like meat, then some Italian sausage is good. This weekend we went to Pizza Paradiso in Georgetown and had the Atomica- salami, olives, and red pepper flakes. Perfect and delicious! I also love sausage and mushrooms or artichoke hearts, mushrooms, and roasted red peppers. What a delicious book! Even if I don’t win it, I might just have to buy it. Thanks for the recommendation! Yum. This all sounds so delicious! I love grilling once the weather warms. I like mushrooms best on my pizza. And being in Chicago, we have ample opps. to eat thin, deep-dish and pan all within a few minutes from home. What a fun cookbook! My favorite topping would probably have to be cheese. Boring, I know, but pizza is just not pizza without lots of cheese!! My favorite pizza is a thin, crispy crust with lots of spicy tomato sauce, pepperoni, green peppers, caramelized onions and gooey, melted mozzarella cheese. One of my favorite foods. I have not made grilled pizza since having kids, but I think this will get me back into it. That dessert pizza looks great. I like cheese and fresh basil. Can’t say I’ve met any pizza toppings I didn’t like… but the most unique one I recently fell in love with had gorgonzola, balsmic-dressed arugula, and maple-roasted acorn squash!! So delicious, and never would’ve thought to put those all together myself! Yum! We just tried grilled pizza for the first time 2 weeks ago – it was a BBQ clean-out the fridge pizza which was amazing! Left over smoked cornish hen, smoked sausage, BBQ sauce , sauted onions and peppers, and (yes this sounds weird but it was delicious) leftover sweet potato fries… and of course tons of cheese! We did some grilled sourdough flatbread last night with just butter and garlic with a bit of romano cheese on top and that was incredible too! So glad to see a book about grilling bread! I am obsessed with white pizza with tons of garlic, as well as grilled pizzas piled high with every fresh veggie in the garden or crisper. I love to throw all sorts of fresh veggies and leftover meat bits on pizza to dress it up, but the most amazing pizza I ever had was at a local brick oven restaurant where they offer a white pizza with artichokes on alfredo sauce. Heaven in your mouth. My favorite pizza topping is black bean, diced tomato, diced green pepper, smoked cheddar and avocado on a whole wheat pizza crust! The absolute best, homemade creation! I love pineapple on pizza. There is a place I get pizza that has a pepperoni, bacon, pineapple, extra cheese pizza that is delicious. But a classic, well-made margherita pizza is wonderful. What a great cookbook to have. I still have not found a great pizza crust in the area where I live. When I make pizza’s it has to have spicy sauce, mushrooms, ham (yes ham), olives, cheese (that I make). onions and a few other things that I forget about. Grilling them is the best isn’t it. I totally love pizza…all kinds. I try to do a homemade version every week. My 3 boys & the hubs usually approve all my creations. This looks like a totally awesome book. Cheese….lots of cheese. It’s amazing how you can really add to a pizza by using different kinds of cheese that you might not expect to find on a pizza. What a delight Andrea. I was just looking at the pizza grill stone and thinking I need to try a grill pizza. How amazing your ‘dessert’ pizza looks – I didn’t guess! Can’t think of much I don’t think is my favorite thing on a pizza. This looks excellent, I’ll be watching for your savory toppings. Hmmm….let’s see….sausage, pineapple, potato, fresh cracked egg and lots of fresh basil! No doubt, it’s fresh fig and fennel pizza. Figs, fennel, and shallots are caramelized, then topped with blue cheese, fresh rosemary, toasted walnuts, and lemon zest. It’s heaven I tell you. I know someone already mentioned some of these toppings but what can I say? Fennel, grilled figs and prosciutto with a light sprinkling of cheese. Simple and full of flavor. Never tire of it. I need to move somewhere where I can have a fig tree. We don’t make homemade pizza often, mostly because I don’t think of it in time. I need to try and remember to make dough more often, because once you have the dough, the pies go together fairly quickly. My favorite topping combination is sausage, fresh mushrooms and red onions with lots of thyme. My 7yo is a fan of white pizza with spinach and garlic. And of course anything with huge amounts of fresh basil is fabulous. Neil and Susan from Food Blogga have my heart. But it it’s on that pizza crust in your skillet, that’s my favorite topping! Does that make it clear. Aside from pizzas loaded with cheese, I have two other favorites. Both are simple. If using a commercial pizza base, sprinkle a layer of asiago cheese on top (not a heavy layer, just a flavor-interest layer) before baking. After baking, top with the chopped spicy olives and a little of the sauce. I remembered another favorite, an individual white pizza pie. Brush the pizza base with garlic-flavored olive oil. The base should not be too thick. Add a layer of grated Italian fontina cheese and bake crust to golden brown. Serve garnished with a few strips of good quality red pimento and a couple of small scallions. For yummy overkill, spoon a little grated fresh parmesan, or even fresh mozzarella, over the top at the table. The spring onions in particular are a wonderful complement to the cheese. I was first introduced to this lovely pizza in a small Italian cafe which sadly has since closed its doors. I never got around to trying their very popular antipasto bar because I simply had to have that pizza, always followed by cappuccino for dessert, and a smile on my face. We love grilled chicken, fresh tom’s, spinach and garlic….yummy! Thanks to everyone who entered! I will contact the winners via email and post the announcement in the next few days. Jalapeno, fetta, mozzarella and pepperoni. Yum. Bruscetta Pizza….out of this world!